It has come and gone, never thought once around the clock could go that fast. I am sure all who were able to attend enjoyed the stellar event. The tasty food, great venue, and camaraderie, have become de rigueur. A couple of the high lights and in no particular order were the up close and personals with not just Emanuele but the e-tron and a great Q & A with the drivers. Friday's evening meal was of particular note along with the "Audi Bistro." Many especially enjoyed the opportunity to have a little race food. Who knows in trying to out do themselves next year one might see Leberkäse sandwiches, warm pretzels to go with the cold beer and to round things off that ubiquitous race food desert, funnel cakes. David and the boys from Hooked on Driving will be at it again stretching the legs of their Audi's and other cars on March 31 at Homestead Miami Speedway and on April 28th at Palm Beach International Raceway. Give David a shout at david.loppert@earthlink.net for additional information. Hooked on Driving is one of our chapters sponsors. The region will be having a fun run on April 28th. It will start at the Melbourne Audi dealership and end at the Jolly Gator Fish Camp on the St Johns River, Route 46 just outside of Geneva. To sign up or for additional details on this event including start time, Contact Kim at Kim.Keller@qinetiq-na.com or Trish attkeller@chsmedical.com. April 7th, 7:00 AM Cars and Coffee. Join enthusiasts of other marks for a little cars and coffee at both Audi of Tampa (Reeves Motorsport facility) and Suncoast Audi in Sarasota. We will be in their private room but they may book another group if necessary (there is a fee for exclusive use). Please make your RSVP's to Jim Vandercrake at jvander4@verizon.net by noon April 20th. Work continues with the new logo. The Chapter's Andreas is working with National's Andreas on the latest revisions. At Sebring, the BoD reviewed the examples received from ACNA and some additional changes were suggested to make the logo less busy. Walter continues to work with National's Andreas on our new website. Once we have an internally agreed upon and an ACNA/AoA approved chapter logo, shortly there after we should be able to launch the new site. It will have a professional branded feel and look being very similar to AoA and National's websites. Earlier this year while on one of those adventures of a lifetime, I was resting on the second floor railing at the Audi Forum Neckarsulm overlooking the new car delivery area. I am sure a few of you have been to Neckarsulm and others have participated in the European Delivery program Audi offers at the Ingolstadt Forum. If not perhaps that is something that should be added to your TTD (things to do) list. From my vantage point, possibly a good 15 meters up, there was a never-ending procession of folks checking in and being met at the swinging gate to enter the delivery area. It was here they were presented with their new Audis. In one corner, there was a Q5 with a gigantic bow on the hood and then two Amalfi white A1's diesels were driven into the area. Two young ladies, obviously twins though wearing different jackets were there to pick up what looked like identical A1's. Now I am sure that is not the first time twins have bought the same car and had them delivered simultaneously, but to watch it was fun and possibly it was also on their birthday. Perhaps, I should have gone downstairs, congratulated them, and taken a picture. Another interesting item is that through November 2011, Audi UK sold about 4 thousand more cars than AoA (Audi media source). Clearly, one can deduce that the Brits are using a different business model to justify the significant number of additional models and iterations that are available with right hand drives. For starters, these include the A1, RS3 Sportback, RS4 Avants, S5 Coupes, A6 Avants, S6 Avants, A6 allroads, and the Q3. In addition, diesels are available in practically all models across the line including the TT but excluding the R8. To those of you, who recently joined the ACNA, welcome. 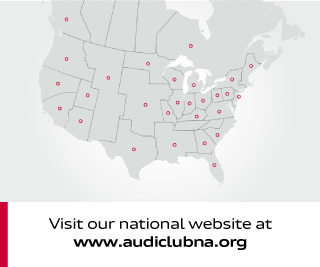 In addition to the camaraderie, there are numerous benefits from membership including the club loyalty program, which is worth $500 upon the purchase of a new, or CPO'ed Audi (see http://www.audiclubna.org/ for details). In approximately 45 days of one's purchase of an Audi, the ACNA sends you a loyalty check for $500. It is almost like found money or even better your own private stimulus check. Finally, this newsletter is being sent out on the Gmail account. 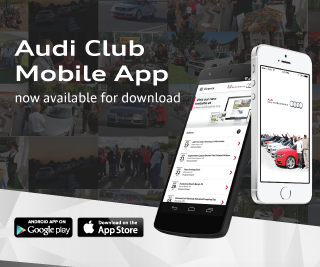 Please use the bob@audiclubfl.org address for any correspondence, thanks.